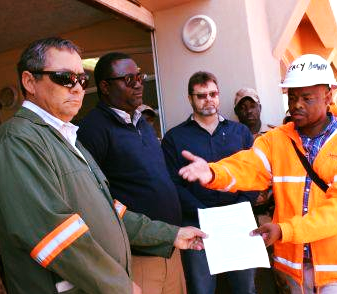 Pictured: Vice President of Swakop Uranium, Percy McCallum, receives a petition from employees of the Husab Mine Uranium Mine. Swakop Uranium threatened the person responsible for secretly recording a consultative meeting between the senior management of the company and the Erongo Regional Governor with legal action. Short on the heels of the National Union of Namibian Workers tearing into Cleophas Mutjavikua, the Erongo Regional Governor, for his perceived betrayal of Husab employees during a series of meetings with the top management of Swakop Uranium, the company decried the fall out caused by the distribution of the secret recording on social media. In this regard an official statement was issued by the Vice President of Swakop Uranium, Percy McCallum, which followed shortly after an official statement by the Office of the Governor denying the allegation leveled against him by the NUNW. 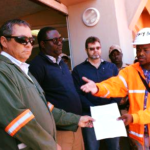 Wage negotiations between Swakop Uranium and Mine Workers Union of Namibia commenced on 15 October 2018. It was then agreed by both parties to invite the Honourable Governor to act as mediator on the differences of wages between the two parties on 18 and 19 February 2019. During the two days of mediation, tremendous progress was made between the two parties and the Honourable Governor, as mediator, insisted on the Company to make compromises to ensure a speedy and acceptable wage agreement for Swakop Uranium employees. The Governor, as part of the mediation process, called for individual sessions with both parties to wage dispute during the two days. Social media then reported on an alleged “confidential” recording between the Governor and Swakop Uranium. Swakop Uranium wishes to advise that it did not record any caucus meetings between the Governor and Swakop Uranium, nor did it give permission to any third party to record such conversation nor did it provide any confidential information to any third party. The Company reserves the right to investigate the unauthorised and illegal recording of the caucus conversations between the governor and Swakop Uranium as such information is privileged and confidential. Such recordings are unethical and illegal. Without prejudice to any right which the Company may have in law, and without any prejudice to any other remedy available to it , the Company reserves the right to take action as may be warranted under the circumstances, including legal action against the perpetrators.